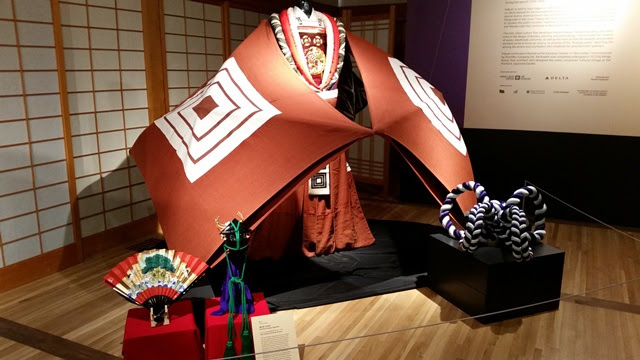 As part of a year-long celebration of the opening of its Cultural Village, the Portland Japanese Garden held an exhibition of kabuki costumes which ran July 29th to September 3rd. 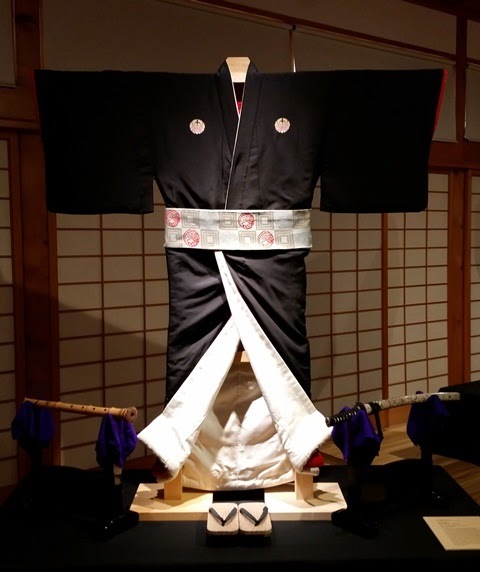 Costumes for the exhibition were selected by master costumer Tsuji Masao and provided by Shochiku Grand Kabuki. 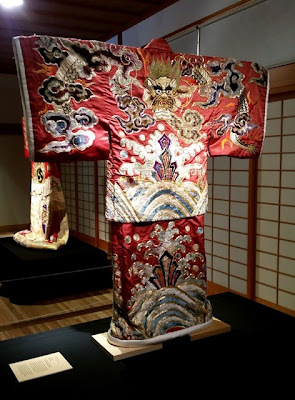 Costume for Kamakura Gongoro Kagemasa in Shibaraku. This aragoto or dynamic superhero role is one of the most dynamic in the kabuki repertoire. First performed in 1697 by Ichikawa Danjuro, the role is only ever performed by members of the Nakamura family. 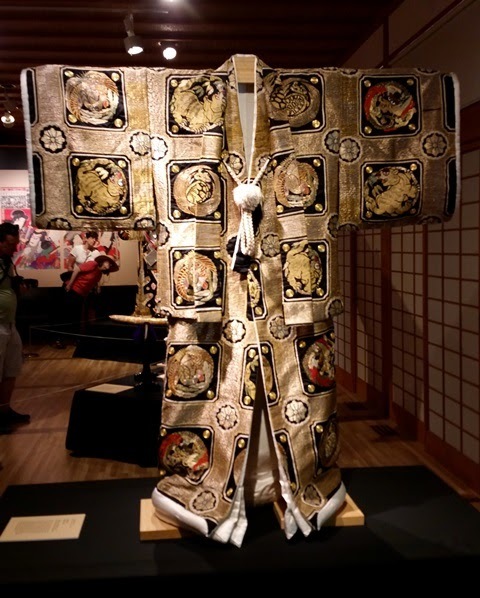 The costume features enormous sleeves with three white squares on a kaki-iro (persimmon color) background, the crest and color of Danjuro's acting family, Naritaya. 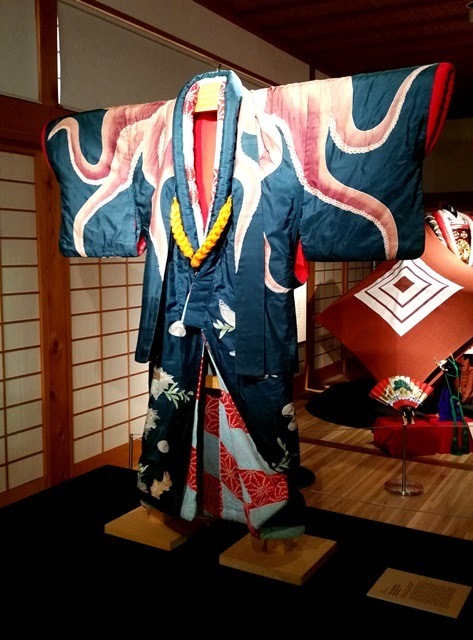 Costume for Kashima Nyudo Shinsai (Namazu Bozu) in Shibaraku. 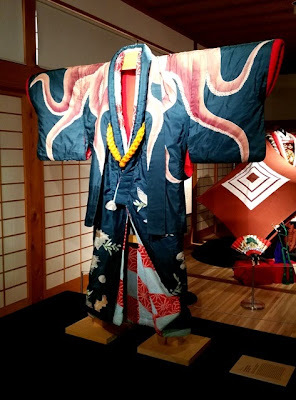 This villain role of the Namazu Bozu (catfish priest) features a haori (jacket) with an octopus motif, indicating a slippery character. This style of motif is called kubinuki because the actor's head appears to pop right out of the octopus body. Costume for Hanakawado Sukeroku in Sukeroku, the Flower of Edo. The title role of Sukeroku was first performed by Ichikawa Danjuro II in 1713. This dashing hero is considered to be the most handsome in the kabuki repertoire. The ginko and peony montsuki (family crest) on the kimono belonged to the family of the Shogun's wife and was awarded to Danjuro by a high-ranking member of the wife's household. It has since become the unofficial crest (kae-mon) of the Danjuro family. Costume for Miuraya Agemaki in Sukeroku, the Flower of Edo. 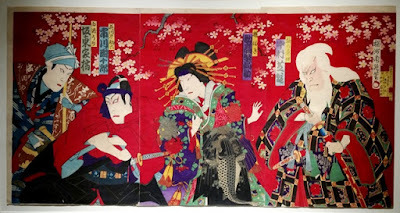 Agemaki is the titular hero's lover and a high-ranking courtesan. 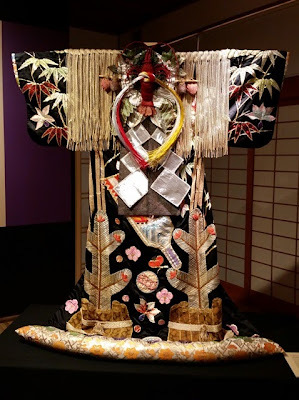 She first appears in a formal procession wearing this uchikake (outer robe) featuring New Year's motifs including pine, bamboo, and kadomatsu. 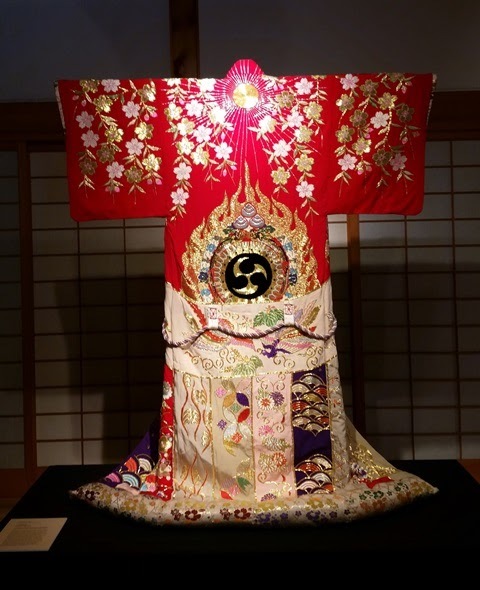 This uchikake (outer robe) features a March motif including cherry blossoms and Hina Matusuri (Doll/Girls Festival) symbols. Agemaki wears five seasonally themed uchikake throughout the play. Costume for Hige no Ikyu in Sukeroku, the Flower of Edo. These elaborate robes are worn by the villain of the play, the wealthy and powerful priest Ikyu. The pattern is of a coffered ceiling (gotenjo) with powerful dragons, tigers, and turtles. The gaudy motif of dragons, clouds, and waves on a vivid red background are suited to the villainous Ikyu who prefers to openly display his powerful position. 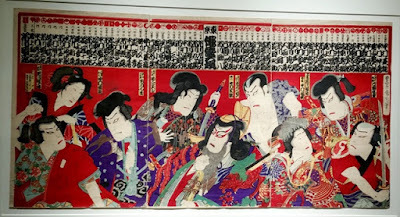 This woodblock print triptych features (left-to-right) Sukeroku, Sukeroku's brother, Agemaki, and Ikyu. 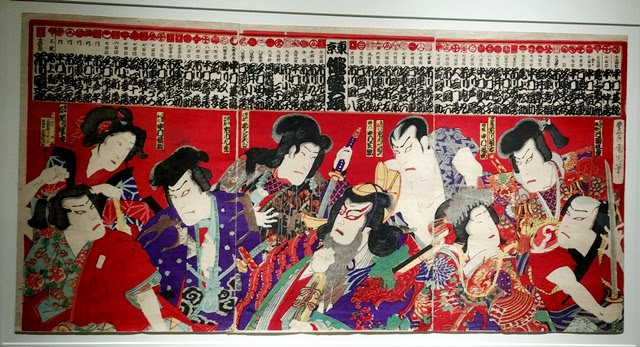 This woodblock print triptych features eight actors in nine roles with the salary of 64 actors along the top. At the time, an actor's popularity would decide his wages and avid kabuki fans followed these rankings closely.